studios | How Big is Your Meat Axe? How Big is Your Meat Axe? The generic term for the C Stand is Gobo Stand or Grip Stand. The Gobo Head attaches to the baby pin mount at the top of the stand, and the Gobo Arm then slides into this. It is virtually impossible to keep these suckers tightened when transporting them. You can try, by cranking the bajeezus out of the T-Handles, but invariably they manage to loosen themselves and as soon as you pick one up, they attack. When you set them up in a row, its called “soldiering them up”, which seems ominous to me. There is also a small C Stand, most commonly called a Gary Coleman (RIP). (I think he may have been accepting of this term as I once saw a photograph of the actor posing with one of his namesakes and he had a big smile on his face.) Other terms include Danny Devito and Billy Barty, though the last one I only learned today. The Gobo Arms on these smaller versions are 20 inches rather than the standard 40 inches. Question: I have run across small stands of slightly different height. Do these other names refer to specific sizes? Is the Danny Devito a little taller than the Gary Coleman? I also found a useful video from crewplay.com on the basic handling of the C Stand, which can help minimize the damage these blood thirty creatures inflict. 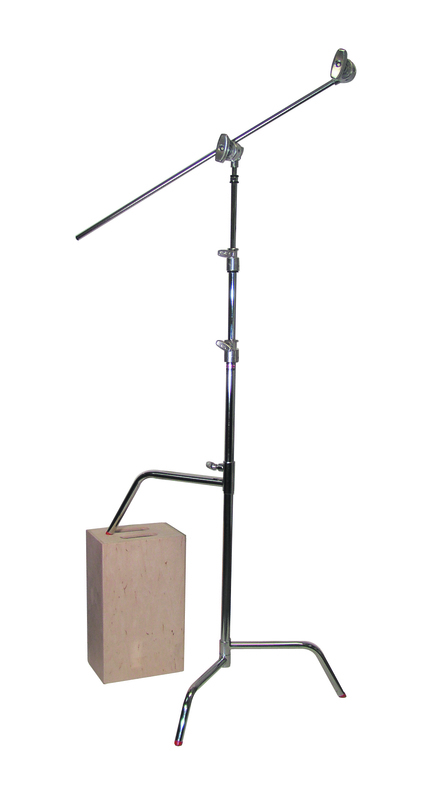 Along with Matthews Grip, American Grip and Modern Studio Equipment all make versions of this stand. Norms also used to manufacture their own version, and though they went out of business earlier this year, their stands are still out there. Next week: The Combo Stand; What in the hell is a Lollipop Head? ?